Its finally time to start of my guest post, even though I am not on holiday yet I am a little busy with sorting everything out before I go. I really did receive some fabulous entries and it would have been amazing to chose each and everyone of you but due to the number of entries it would have been very hard. Today I am sharing with you one of my all time favourite bloggers/YouTuber Megan Isobel, all her videos and posts are very informative but still very interesting and I am sure you will (or already) love her blog as much as I do! 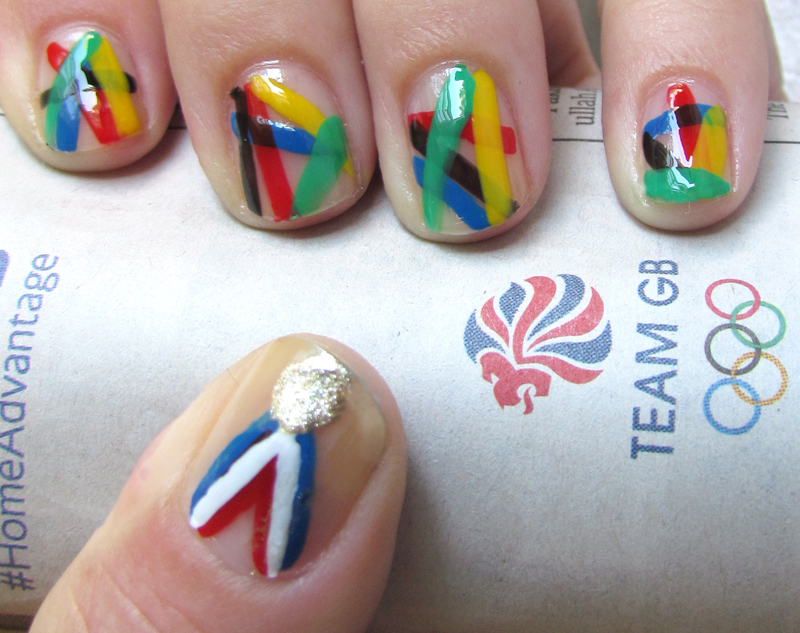 As it is the Olympic opening ceremony today Megan will be showing you a fabulous nail tutorial which isn’t too difficult that is inspired by the Olympics. I hope you all like the tutorial and give it a go yourself, I will be trying it later today. If you happen to follow me on Twitter, you might know that I live in East London and my patience for the Olympics has been waring a little thin. However I still have a massive admiration for the effort and dedication that Olympic and Paralympic athletes put in everyday and not just when the world is watching. So I thought I’d do a quick nail design in their honour. Olympic rings seemed a bit obvious (read: tricky!) so I decided to go for an abstract stripe design on my nails, and little gold medals on my thumb. If you have nail stripers, this will be a lot easier, but I just used the brush of my polishes and a (reasonably) steady hand. 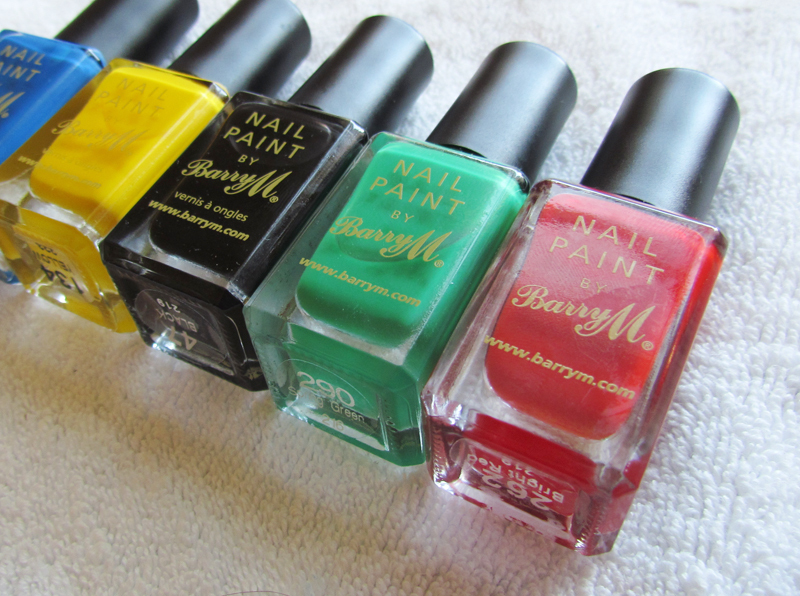 I used five shades from Barry M: 134 Yellow, 262 Bright Red, 290 Spring Green, 291 Cobalt Blue and 47 Black. I also used Rimmel Nail Tip Whitener and 5-in-1 base and top coat, which is really reasonably priced and helps to seal in designs for a few more days. The gold used for the medal detail is by NailGirls from this month’s JolieBox, but any gold (or silver, or bronze) will do. Paint your nails with a base coat and then paint a random stripe of your first colour onto your nails. It’s easiest to keep the brush still and rotate the nail to get a smooth stripe. Let it dry for a few seconds and move on to the next colour until you have all five Olympic ring colours on your nails. For the thumbnail medal design, start with a blue v-shape, allow to dry and follow the same shape with parallel lines of red. Separate the blue and red lines with a white striper and, finally, paint a small circle or dot of metallic nail polish for the medal. 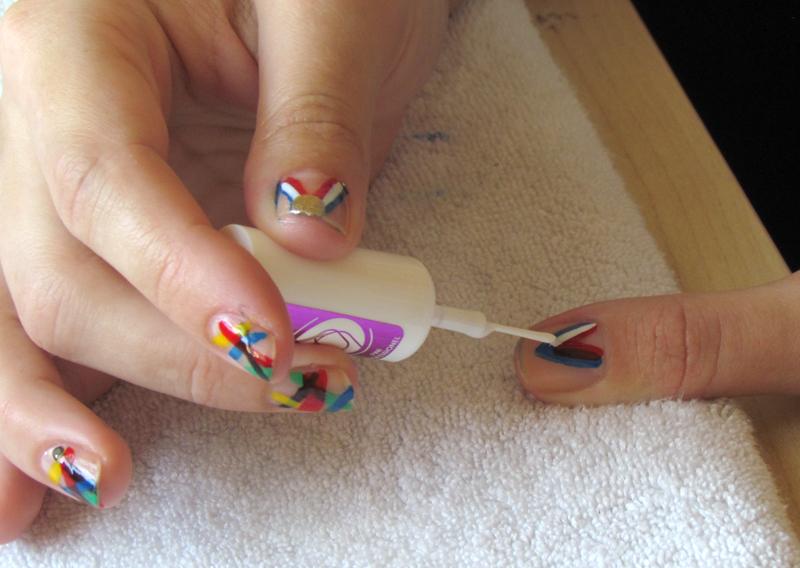 What an effective and easy nail art wouldn’t you agree? Thanks so much to Megan for sharing this fabulous post here on A Little Obsessed. Don’t forget to check out Megan’s Blog, Twitter and Youtube I have included her latest video below so you can all watch it and hopefully subscribe! What excites you most about the Olympics? Will you be giving this fab Nail art a go? I thought I had no interest in olympics… and tehn I saw these…. soo cool!